There is NOTHING like the Bale Barn! Competitors are literally green with envy! Are You Tired Of Wasted Hay In The Pasture? The people at Bale Barns, LLC are horse people and understand all the frustrations and expense of trying to feed horses responsibly and reliably! We’ve all seen it. Hay scattered and strewn all around the feeder— tramped in mud, urine, or worse! With the cost of hay this is an unhappy sight to say the least. If you live in a wet or damp climate, now the fear of “mold” becomes an issue- and that can mean colic, illness, or vet bills. Would You Like To Enjoy The Benefits That A Slow Feeder Has To Offer & Protect Your Hay At The Same Time? Horses all benefit from frequent, small meals. It is better for digestion and helps to support normalized digestion which is critical to “easy keepers”. A slow feeding net not only prevents horses from dragging out large chunks of hay onto the ground where it can be trampled and soiled, but a good hay net helps your horses eat more methodically with smaller bites over a long period of time. This is great for digestion, physical, and even mental health— after all, nothing makes horses happier than eating! So What Makes Bale Barns So Superior To Competitors? * More Durable- Bale Barns are made of 100% virgin LLDPE. A specialized polyethylene with UV inhibitor - LLDPE was chosen to ensure many years of flexibility without cracking. * Cooler Inside During Hot Temperatures-Basic thermodynamics supports our findings: darker colors absorb more heat than lighter colors. * Virgin Materials (not weaker ‘recycled’ materials!) Bale Barns are made from 100% virgin material to ensure integrity of material, to maintain high quality and flexibility, and to allow for the light color of the Tumbleweed Tan. Recycled material has to be darker to cover the variations in the recycled products and also has to be thicker to allow for variations due to impurities in recycled material. *Wider Stance- Creates more stability in High Wind Areas. No need for anchors. Easily fits over Any Large Round, Large Square or Multiple small bales. Base remains wide open. No sagging when tipping. * Solid One Piece Construction- Eliminates the twisting and cracking problems as well as the loose and missing bolts common with other 2 piece models. *TAPERED SIDES- Hamper physical contact from stock, eliminating damage to windows and roofs. * VERY PROUDLY 100% MADE IN THE USA— that’s right… we’re not made outside the USA! How Long Can I Expect My Bale Barn To Last ? The original Bale Barn prototype built in 2000 is still in daily use. Bale Barns have evolved over the past 16 years to address issues such as easier shipping and the integrated slow feed net. A customer should expect the Bale Barn to provide at least ten years of daily use. What Are Bale Barns Made Of ? Bale Barns are made of 100% virgin LLDPE. A specialized polyethylene with UV inhibitor LLDPE was chosen to ensure many years of flexibility -without cracking! Why Does Bale Barns Use Virgin LLDPE Instead Of Recycled Plastic Like Our Competitor? Bale Barns are made from 100% virgin material to ensure integrity of material, to maintain high quality and flexibility, and to allow for the light color of the Tumbleweed Tan. Recycled material has to be darker to cover the variations in the recycled products and also has to be thicker to allow for variations due to impurities in recycled material. Is True That Bale Barn Stays MUCH Cooler Than Our Darker Competitor? YES! Basic thermodynamics supports our findings: darker colors absorb more heat than lighter colors. Our research on temperature difference demonstrated that the green covers were on average 30 to 50 degrees hotter than our Tumbleweed Tan Bale Barn. A cooler temperature provides a more pleasant equine experience and extends the life of the hay. (Hotter temperatures coupled with humidity increase the chances of mold.) Another advantage of a light color like Tumbleweed Tan is the extended longevity of the Bale Barn. Does The Bale Barn Collapse When It Is On Its Side? NO! The Bale Barn is designed with 2 reinforcement bands to help the Bale Barn maintain its shape. The double band reinforcement ensures the Bale Barn does not collapse when on its side during the hay loading process. Since the Bale Barn does not collapse when on its side, it makes flipping the Bale Barn over any size bale of hay very easy. What If I Don’t Want The Slow Feeder Net? While the Bale Barn IS available without the slow feeder net, we want you to understand that the net is worth every dime! Not only does it keep your hay from being dragged out and stomped into the ground, but it helps horses to eat, swallow and digest smaller, more uniform mouthfuls. This is HUGE savings on hay— and vet bills— and it keeps horses happily eating for hours at a time! What If I Don’t Have A Tractor To Use? NO TRACTOR, NO PROBLEM, Just bring those big bales home as needed! Strip the bale of its net wrap or hay strings. Set the bale in its place. Flip the Netted Barn over bale and you're DONE! Strip It, Set It, Flip It, and you’re DONE! Can Women Easily Use The Bale Barn? Yes! The Bale Barn is 8' x 8' square by 69" tall and only weighs 170 pounds making it very easy to handle. Some folks say that is short. Equine are grazers- they eat off the ground not over their heads.The larger base and lower profile makes it more stable in high winds without the need of anchoring. It has 8 large windows to allow plenty of room for your herd. The tapered sides eliminates the stock from leaning and pushing on the unit. NOTE: The extra supports at the bottom help it hold its shape to stay wide open for lowering over those large bales without hanging up on them. What Do Horse People Say About Their Bale Barns? You'll love our TESTIMONIALS! People rave about the savings, longevity, durability and health benefits of their Bale Barns! Came across this at Sacramento horse expo a few years ago, made a mental note to buy this when I get my horses home. Best decision ever. Most certainly the greatest feeder ever. I love only having to touch hay every 15 days, horses are never hungry, always busy, my boy with ulcers seems completely cured in just 3 short months, all three horses are keeping perfect weight, no vices or boredom related shenanigans, no more fighting over food or food-possessive behaviors, no wastage, all dirt from hay falls to the bottom so eating cleaner stuff. I have no idea why everyone doesn’t use it. hut I was very leery to believe your claims which now I find to be the truth. The Bale Barn is lighter, stronger and much easier to handle. The most important thing is they don't tear up. I have had 4 of the "hay huts" and 3 tore completely up 1 is still standing although with 1 side ​completely tore up, it is on the last leg. The Bale Barn has saved me a lot of money and has made it easier to afford the 30 horses I have. THANK YOU BALE BARNS! I have a horse boarding business and I began buying your competitor the hay hut in 2012. We had a total of 5, and of the 5, 4 of them have cracked and had to be replaced. The first one that cracked was covered under warranty (one year) but the rest of them we would have to buy. They all crack in the same place - a horizontal line going from either side of the windows on each flat side. I was really in a pickle as to what to do. I decided there was no choice but to try this product, though I was feeling doubtful from my past feeder experience. The first thing I noticed was how wider it was at the base. It was also much lighter and the plastic seemed more flexible. It was so much easier to maneuver over a bale. Plus my being alone most days, I appreciated the lightness, since I am handling these mostly with no help. It will be two years with the Bale Barn this coming summer, and no cracks. I now have two Bale Barns and 1 last hay hut that is cracking up so a third Bale Barn will be on the way. One of the things about it is the wider base takes away a lot of leverage for the horses to push against. They would push against the hay hut with their chests and eventually cause the cracking. The more flexible plastic in the Bale Barns also seems to be more durable and gives instead of being hard and brittle. It really is a blessing to have Bale Barns as an option for feeding hay to our horses. I would like to thank you for a product that does exactly what it says it will do. I love my 4 Bale Barns and could not go back to being without them! In just weeks the hay savings is already unbelievable and the ease of use is amazing. The ground around my Bale Barns are spotless, so glad I went with the integrated slow feed net. I am a school bus driver and the time these will save me in my daily routine will be much appreciated. I purchased my Bale Barns from Murdoch's Ranch and Home Supply and picked them up at the Longmont, CO. store. The great folks at Murdoch's were more than helpful in assisting me with my purchase. I will recommend your product to everyone I know. I am a Very Satisfied Customer! I just can't say how much I love my Bale Barns! I originally purchased Hay Huts and I like to use nets to keep them from wasting hay. The fight to get the large hay nets on then putting the bale under the Hay Hut was just so time consuming. Then I discovered Bale Barns and their integrated net! Made my life so much easier! Also as a breeder I love that they are very sturdy and help me keep hay in front of my mares 24/7. I highly recommend Bale Barns! I now own 4 Netted Bale Barns. How Much Does The Bale Barn Cost? The real question is ‘How much does the Bale Barn SAVE!’ The Bale Barn pays for itself in savings of hay— and health— for your horses in just a few short months— and it lasts for decades! 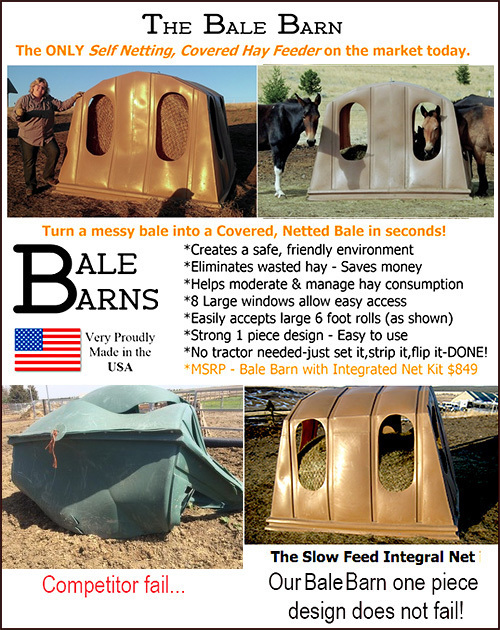 It is only $695 without the slow feeder net and $849 for net and Bale Barn combined. Call and talk to Patrick today!